Last night whilst waiting to meet friends for dinner, I took a stroll down by the waterfront in town. After last weeks long exposure success with the Ricoh, I wanted to give it another go. 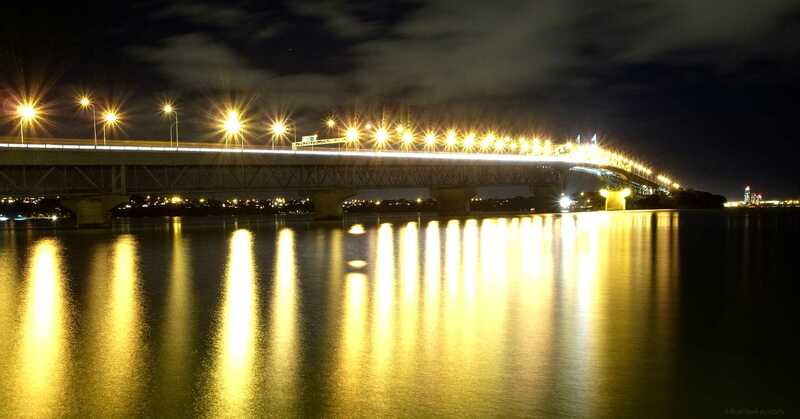 Auckland Harbour Bridge was built in the 1950’s and opened in 1959. By 1969 it was deemed to small already (someones bad forward planning) and we had to add two extra lanes on each side of the bridge – the “Nippon Clipons” – named due to Japan getting the contract to make them. In the 1990’s we added a center barrier, due to a high number of fatal head on collisions. Unsurprisingly, since the clipons were added, traffic flow has grown immensely. As with many bridges around the world, its an ongoing piece of maintenance to keep in critical day to day use for 170.000+ motorists each day. Captured on the GRD IV, with an exposure of 60 seconds at 100asa / f7. Aspect cropped a little in post using Gimp, and contrast bumped up one notch.